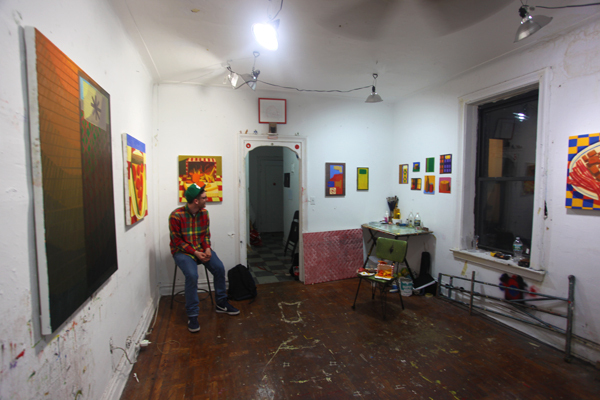 Anthony Palocci Jr‘s studio was also located in the old dormitory converted studio building at Pratt. 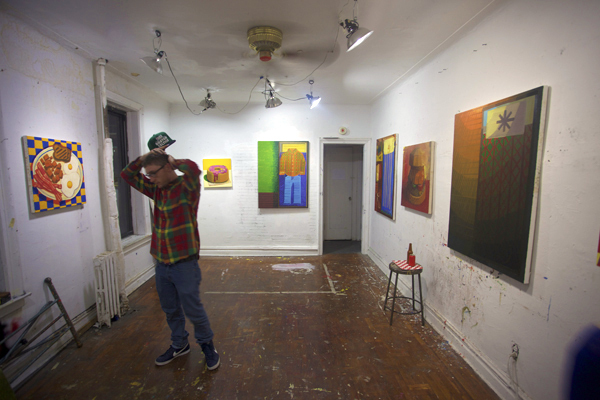 He invited us into his cleaned up studio. 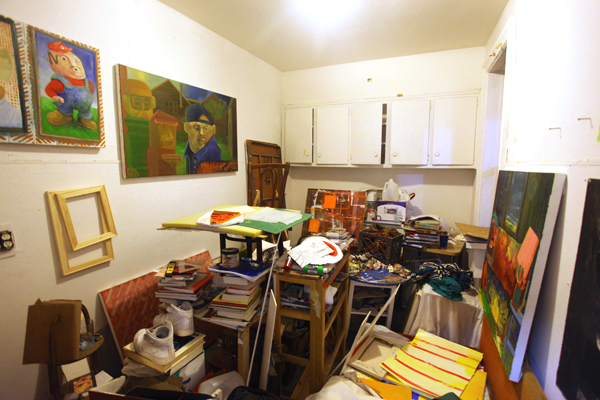 There, you could see the remenants of a completely utilized space but without the regular wear and tear of everyday studio. 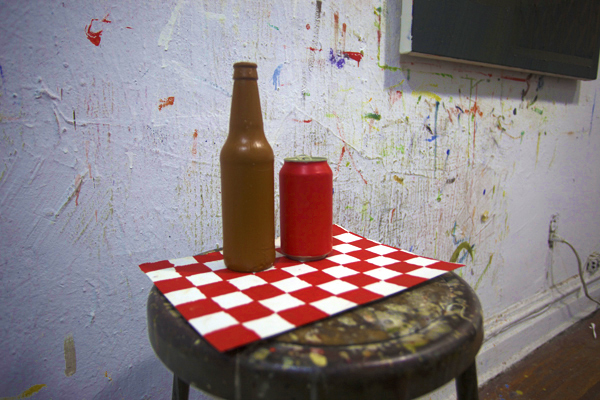 His work consists of observational paintings created from paper models jerry rigged together. F: Do you mainly work in oils? APJ: Now I just do oil paint. I make drawings with charcoal and pastel but when I use paint, it’s just oil. F: I think its really effective. From the sketches, do you create the painting or do they come together by themselves like painting as painting? APJ: I’ll make sketches in my sketchbook just to figure out ideas of things I should paint. I’ll make drawings from that just kind of working out ideas further than the sketches. From that, I actually…I make models. I have to paint from life so I make models and then I paint them. The beds series – that started out…I had ideas of what I meant to do and I had ideas of how that image could be created. 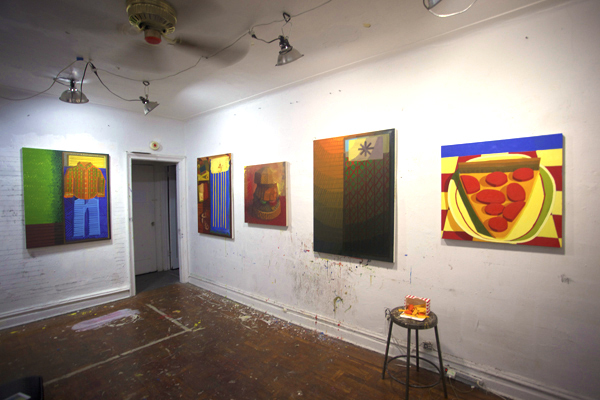 Each painting was a different way that I felt like that could happen and I built a model at first to see how light would hit it if it were made a certain way. Then I kind of went away from the model because I was taken with how flat I could make it. It was this funny thing where it turned into an abstract painting. Then I found myself hitting a wall cause I felt like I wasn’t painting anything anymore so then I made a big model and I painted from that. I mainly do it [paint] from models. F: For all of them? Even the food ones? APJ: Yeah, the food ones specifically, I have to make myself because there’s information there that I couldn’t make up. F: You were talking about the bed series. Was that the first time you made the models? APJ: Yeah, I think the first one that I did isn’t here. It’s the one that’s on the postcard. 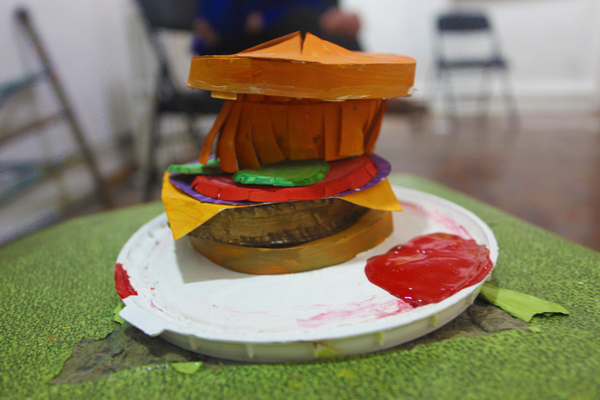 The first food one was the cheeseburger and I made a very small model for that. I cut squares out of a piece of paper to see how light would hit it when you fold it up from the right hand side. That was the first one and then the other ones came and then the final one is that one with the blue and the yellow stripes. That’s the one that’s more directly from a set up. F: Are they all from the same model? Are they just paper and objects that you find or…? 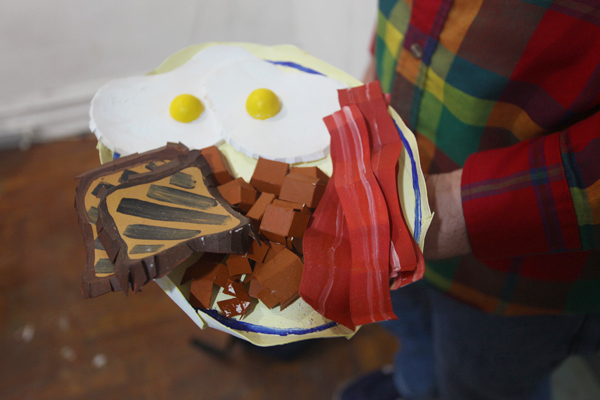 APJ: The food paintings are all made by cutting and folding paper. Thats the only time I use acrylic anymore is when I paint the models themselves. I’ll paint like, to make a pepperoni or a tomato or a chicken nugget, I’ll cut a circle out of stonehenge or some heavy printmaking paper and its larger than I want the actual chicken nugget or pickle or whatever it is to be. I’ll cut fringe, like lines and fold those over so it kind of stands up but before I do that, I’ll mix a color that I want it to be in acrylic and take my brush and paint them all individually. For the pepperoni, for example, I don’t have to make this cadmium red with alizarin crimson in it because I just paint it all cadmium red light. I light it and the rest of it happens and that’s stuff that I need to make a painting. F: I guess when you’re with the bed one for so long, you change up the scene in a sense by changing the sheets or whatever you do to it. You’re working on the painting but you’re also working on the model as well. APJ: Yeah, you got to change your sheets. Yeah, it’s like however many ideas I have of making that one thing. They’re all kind of different based on different ideas. That one’s called Nightlight. That one, I was thinking about this flatness again, but there’s a light source right here in the painting and I broke it up into those radiating circles but then it becomes flat. It becomes some sort of strange color wheel. Its like in a fight with itself because it wants to be flat but those circles don’t meet up so you see these layers of flat plains. If you look at it pictorially, its kind of what I was working with and that’s kind of where the beds were going. If you look at anything from above, you flatten it out so its kind of what happened with those paintings. F: The bed is like this living situation and the burger is sustenance. Is this almost a documentation of your life in a certain sense? Like everyday things? APJ: Right and yeah definitely. 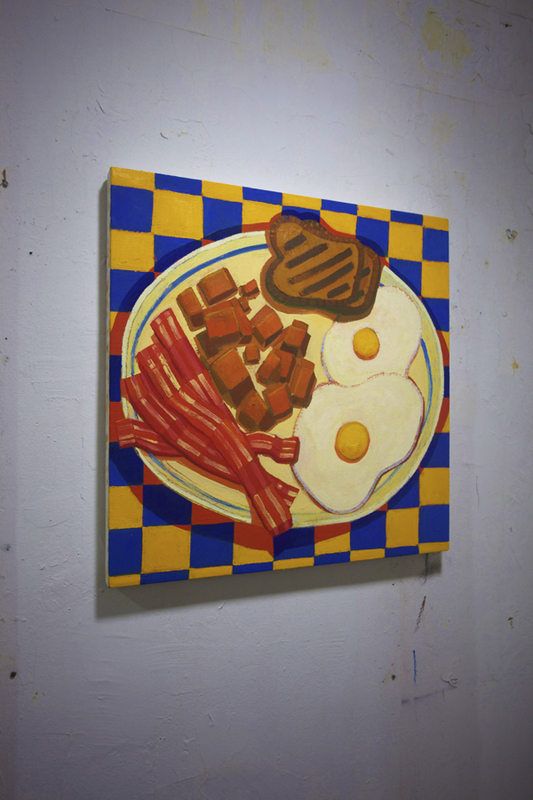 My thesis show was called ‘Eat and Sleep’. For awhile its all I could do. That’s when I say to myself, “Oh, the day is done. The day is beginning. Oh, I have to eat now.” Its just kind of those fundamental things that you don’t really pay a lot of attention to but I feel like they kind of dictate the way we function. Its also, I was thinking about them as, sometimes I think of them as rewards. 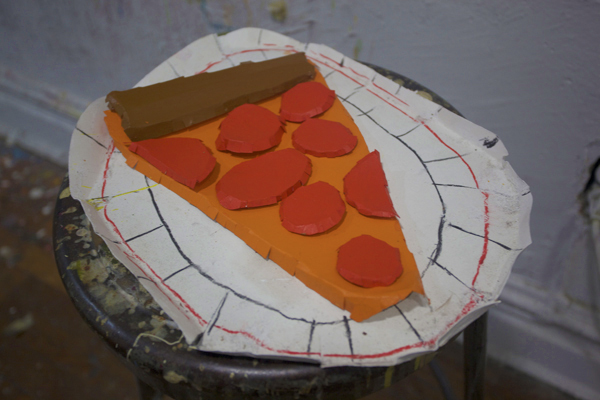 I’m not making a painting of a slice of pizza, I’m painting a model I made of a slice of pizza. The same thing with my bed. I’m not painting my bed, I’m painting a model I made of my bed. So, its like never there and its also, its always the idea of what everything is. I kind of like playing with that more than being literal because I like the idea of looking at this and being like, “Wow, that’s a really fucked up way to see a hamburger.” But its because I’m looking at a hamburger but I like that kind of play with perception. F: You’re like looking for these different layers then the idea of a hamburger or a piece of paper through a painting. APJ: Right. I also like how absurd that is. F: Right. You have to work so hard to get to a hamburger but it’s just a hamburger. APJ: I think that’s funny. F: So the small ones…are they studies? I noticed the green texture one showing up in that painting over there. APJ: Those ones were kind of the last ones that I was doing. They’re ways for me to carry on the ideas that I had while I was making the larger paintings and you kind of see them more so. The ideas that I had weren’t dead to me yet. They’re still stuff that I need to resolve. 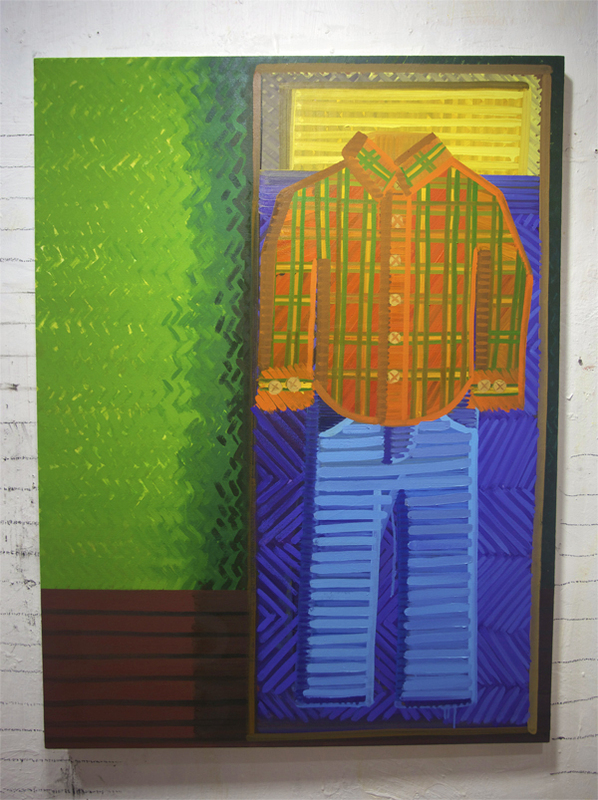 When I was doing that painting with the clothes, I made that big green rug with that wood floor and I was like, “this could be a painting” and I really liked how that looked but I wanted to make it the painting that it was supposed to be. At the same time, I didn’t forget about the painting that it used to be so I wanted to do that again in a different way. It might happen again. These motifs, these sleep motifs like symbol objects, like that bed, it was always a reoccurring thing. I had many ideas about what anything could be. It could’ve been one painting and I could’ve just worked on one painting for 6 months. I could’ve worked on a painting for 2 years but I have so many ideas when I’m painting, I just – as soon as I see that, I’m just, “Oh, I should just stretch another canvas.” I usually have a few going at the same time. When I was thinking about the light happening, it gave me another idea. F: So painting is kind of like your ability to work through that. APJ: Yeah, it’s like putting up a thing of canvas as a necessary thing so I can lend another thing from it. The ideas just keep coming as I’m working – which is a good thing. Its like one thing leads to the next. Not always but sometimes. I made this painting called “Weave” and it was a painting of the weave of a canvas like if you zoomed in and I thought that was what painting was – just layers upon layers and just assembled in a certain order. That started happening and then I thought it was too much surface and there wasn’t anything to the painting but the surface. 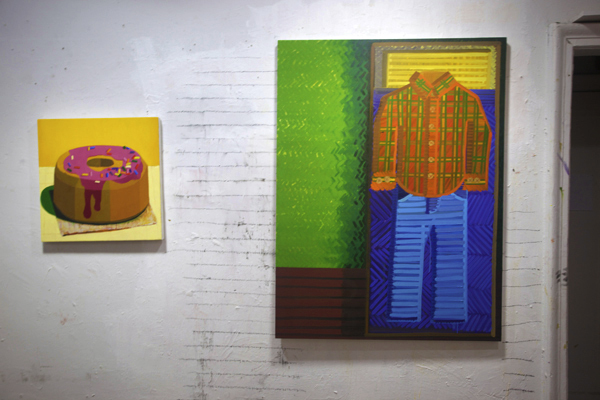 In a lot of ways, that’s all that painting is but I like there to be something there – some upheaval, and for there to be some kind of decision made. That’s why I got into these paintings. That has been reworked several times and stretched on two different stretchers. They always come out of some kind of struggle and I like that in a painting. I like that I can see the work and I like how the painting ends up being the result of something that went on and not just something that was just executed. That’s when I thought I was backing myself up in a corner when I was painting some of the beds, cause I wasn’t painting anything and that happened to me a lot before this body of work. I feel like this [the models] opened that all up for me. I can just make whatever I wanted to paint. I like that. I like that everything comes out of my hand too. I’m not painting a real thing. I’m painting a thing that I made and painting my thing. It’s like making my own world. F: In terms of the space, has that changed the way you work? Can you talk about your studio and how you work in it? APJ: Before here, I was in a space that was much bigger. It was like a warehouse space. 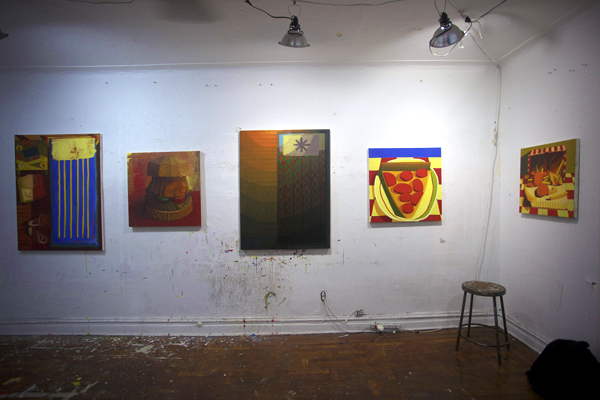 As soon as I got there, I had enough space to make a huge painting – not just a big wall but enough space to look back. So I went into my studio and stretched this huge canvas. It was like the size of half of this [current studio] wall. I was making paintings like that. 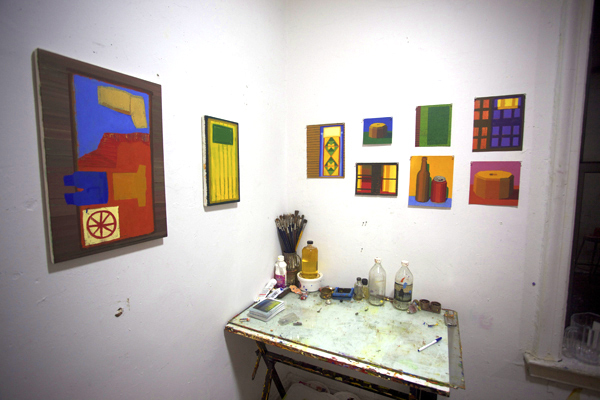 When I moved here, I started to think about scaling down and really honing in on the craft that I was doing – starting to pay attention to mixing color, starting to pay attention to what I was doing with the space and that led me to making the models too. I also have a door now. Before it was just open space. So a lot of people would come in and talk. I would have critiques in school and I just wasn’t finished with work. I feel that that could really screw you up really bad. It takes me a while to make a painting. I need the space. I need the privacy. I like this place. I like feeling like I can spill a bunch of paint on the floor and not worry about it. I have an easel. I like to paint on an easel. I like to paint on the wall. I like to just have a bunch of stuff everywhere. If I feel like making the cheeseburger today then I can do that and its already set up and ready to go. I don’t have to put everything away and put back up. No one else is going to come here and use it so I don’t have to worry about it. This is my place. Normally I’ll have stations. I’ll have a station where I’ll build all the models and a table where I have all my paper and acrylic paint. I have my oil station with my glass palette and all my paint is organized so I know where everything is. I’ll have a drawing station where I keep all my drawings. There’s a definite organization thing that needs to happen so I know where things are and I can do whatever I want that day.